I am back in Colorado for the summer and feelin’ the summertime love! Everything is so green and sunny and hot and I am in my element. So far my summer has consisted of training, fresh meals, pool time, good friends, BBQs, 4-square, long bike rides, nights out in the town and even summer school is more enjoyable. It is crazy to think that July will be here next week–my summer bucket list is still so long! I am on a good pace however, and I am enjoying every moment in the mean time. The day after getting back to FoCo, my best friend and I hit New Belgium Brewery in pursuit of this glorious summer brew. My thing for pineapples never ceases and my friends and fam just fuel the fire. Unfortunately, New Belgium had one keg, and one keg only. Needless to say, they tapped out within the first 30 minutes of opening and I did not get to experience the beer flavor of the summer. I am keeping my fingers crossed for next summer though. I have been making tons of salads lately. They are so refreshing in the summertime and I always get salad cravings during this time of year. Common fixings of mine include: lettuce, carrots, tomato, chicken or tuna, sunflower seeds or avocado and I top it off with a splash of balsamic vinaigrette or some lemon juice and pepper. The mornings I have been enjoying my tea or coffee out on the porch. It is so nice just to sit outside in the morning while everyone else is still asleep. It relaxes me and is a great way to set positive vibes for the rest of the day. For a sweet snack or dessert, I have been devouring the cherries. I always buy them in the summer when they are in season and cheaper than they usually are. They fill me up and satisfy my sweet tooth (teeth). I have also been spending as much time outside as I possibly can. On Sundays, I take my “active recovery” day by doing some type of different outdoor workout. It can range from yoga outside, biking, long runs, swimming or more recently, track workouts. 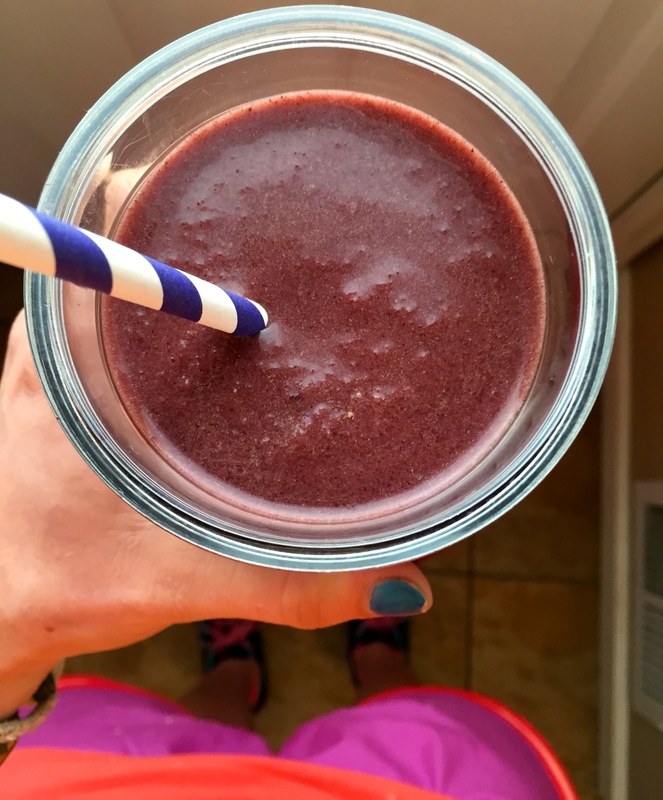 If I don’t have enough time to digest a whole bunch of food before training, I go to my arsenal of smoothie recipes! Lately, it has been this Tropical Açai Power Smoothie.